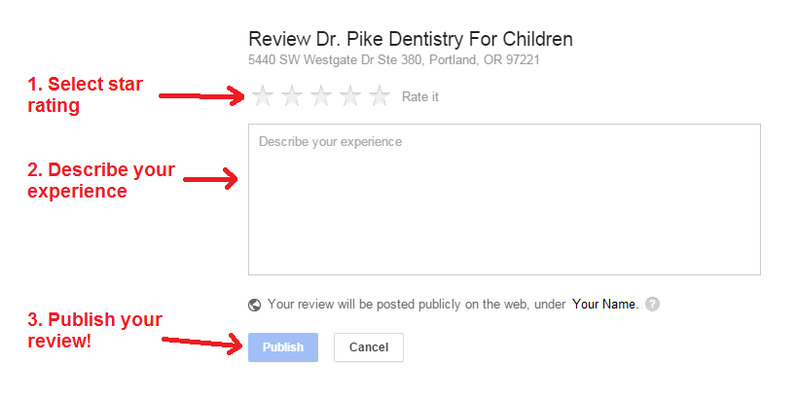 Thank you for taking a moment to leave a review for Dr. Pike Dentistry For Children. Which of the following websites do you have an account with? 1. Click this link to be taken directly to our Google+ Review page. It takes a few seconds to load. 2. You will be prompted to login to your GMAIL account if you’re not already. 3. Follow the steps as outlined in the image below. I have a Yelp account. 1. Click this link to be taken directly to our Yelp Review page. 2. You will need to login to your YELP account if you’re not already. 1. Click here to be taken to our Facebook page. 2. You will need to be logged into your FACEBOOK account. 3. Click the star rating as shown below.